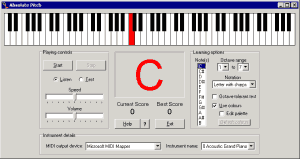 Absolute Pitch is a freeware ear training application for Windows that will help you acquire absolute or perfect pitch. This is the musical ability to name any note played, without the aid of a reference note. Perfect pitch therefore differs from relative pitch, with which a musician can identify notes by using knowledge of the intervals between them. Musicians with extremely good relative pitch can give results indistinguishable from those having absolute pitch, but they are always at a disadvantage in having to hear a reference tone, such as Middle A, first. You may have noticed this in purely vocal concerts, where the musicians hold tuning forks to their ears before starting a new movement. Having absolute pitch makes it easier for a composer or performer, especially of atonal music, to retain and hear complex melodies and harmonies in his or her head (Schoenberg mentions his ability in a letter; Boulez is well known for it). For any singer, it obviates the use of a reference pitch, and ensures that performing without instrumental accompaniment, such as in a barbershop quartet, doesn't risk a gradual sliding out of tune during a piece. The Absolute Pitch program works by presenting notes in an atonal, rather than tonal, context to reduce the possibility of using relative pitch. You learn a particular note by listening to a random sequence that includes the note. Whenever the note is played, your aural recognition is reinforced by visual stimuli that serve to connect the sound of the note with its name and position on the piano keyboard. When you are confident that you know the note well enough, you can proceed to take a test. 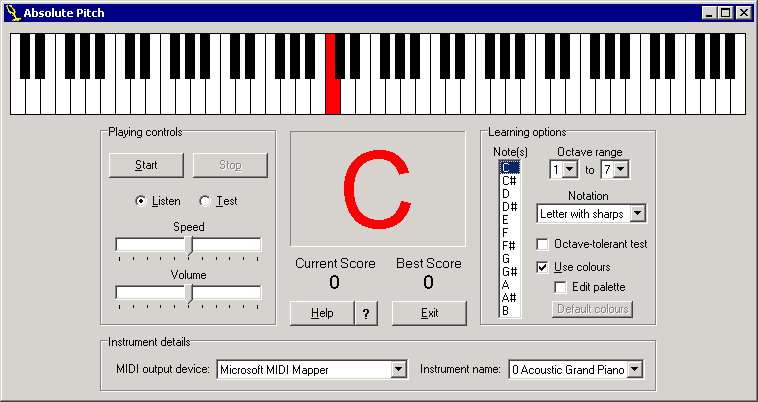 With its resizable seven-octave piano keyboard, the software can also be used to play music using either your mouse or computer keyboard.